Quarry Park and Douglasdale/Glen residents are actively engaged in their community and keeping them informed is our top-priority. 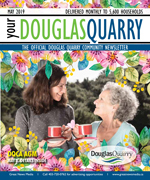 Your DouglasQuarry is the official community newsletter, and covers community news and is published monthly to keep content current and relevant. Delivered to every household, apartment, and business, every resident is acquainted with the community’s most important information. The DouglasQuarry Community Association’s mission is to foster community spirit through recreational, cultural, social, athletic and educational activities. The DQCA’s vision is to build a vibrant community that serves all residents, and is fuelled by the generosity of spirit. The DQCA’s values are the following: volunteerism, open communication, honesty, mutual respect, multiculturalism, social justice, creativity, quality of life, and foremost – community building.